The Mayor of London Boris Johnson has backed proposals for the UK's largest indoor ski facility to be built in Stratford, East London. The plans will be officially submitted by Westfield Stratford City to the London Legacy Development Corporation (LLDC) by the end of the summer for a major leisure attraction on land adjacent to its retail operations. The new ski centre would be more than double size of other similar UK centres. The planning application is also expected to include retail, hotel and restaurant opportunities. The news comes on the first anniversary of the London 2012 Olympics, and as £67.5 million worth of contracts awarded for Olympic Stadium redevelopment. 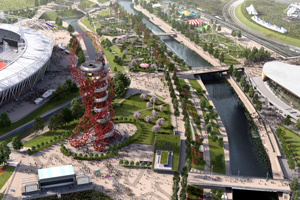 Discussions are also underway for a new UCL university campus at the Queen Elizabeth Olympic Park. Johnson said: "Stratford's status as a stunning new destination is confirmed by Westfield's plans for a world-class indoor ski centre. This underscores the massive confidence in this area from investors which is delivering a real pay back for taxpayers in terms of jobs and the regeneration of East London." The stadium will see the return of Olympic and Paralympic stars this weekend with three days of athletics action during the Sainsbury's Anniversary Games (26-28 July). The North Park will also be hosting the Open East Festival.